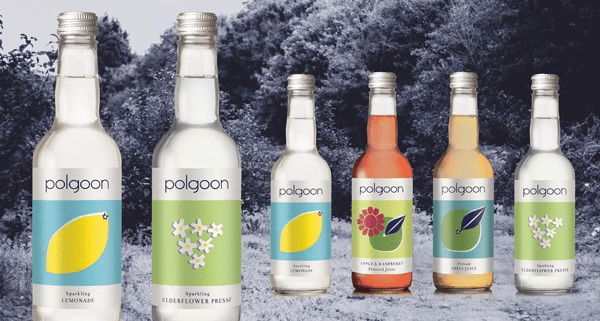 If you have visited us recently you may have noticed that we have made some changes to our list of soft drinks, and we now offer several of Polgoon’s delicious non-alcoholic drinks. Polgoon was established in 2004 at Rosehill in Penzance. Founders John and Kim Coulson bought an old farmhouse, 20 acres of land and outbuildings in need of total renovation. After consulting a leading viticulturist and winemaker, they settled on the idea of planting a vineyard and producing their own wine. Polgoon Vineyard was born, and the first vintage of wine in 2006 was awarded the Waitrose Trophy for the Best Rose in the UK. Ciders and soft drinks followed soon after, using produce from the farm’s orchard. We chat to sales manager Richard Pickersgill, who tells us a little more about the independent, family-run business and what you can see at Polgoon if you make a visit. What are Polgoon’s most popular products? Polgoon produce still and sparkling wines, ciders and soft drinks. We produce around 30,000 bottles of wine each year, and more of ciders and soft drinks. Our bestselling cider is our Original Apple Cider (5% abv) and our Sparkling Elderflower Pressé. What have you launched most recently and are you developing any new drinks? Our new 2013 Sparkling Pinot Noir Rosé has just been released. It’s a wonderfully balanced sparkling Rosé with delicate flavours of tangerine, honey and spice. We are also working on a few new lines including white wine and elderflower spritzer, ginger cider and Sauvignon Blanc. Two acres of vines have just been planted! What was the inspiration for the new soft drinks branding? We wanted the branding to be simple but eye-catching. We like the ‘rootsy’ look of all the soft drinks packaging, and we think the colour schemes compliment the imagery nicely. We wanted a range that would appeal to all ages, for people to enjoy what they are drinking, and to know where it comes from. The feedback we’ve had so far has been very positive. Kingdom & Sparrow, our designers have worked extremely hard to complete the branding project to our specification. We would certainly recommend them to anyone needing a design team. Can people visit the vineyard at Polgoon? Polgoon currently offer a guided tour three times per week, which includes a visit to the orchards and vineyard, where we explain the viticulture process and what’s involved in growing grapes and apples effectively in Cornwall. We take guests into the winery and vat room where they can see first-hand what is involved in the wine and cider-making process. The tour acts as a precursor to the really fun part: the tasting! We host a full tasting of our wines, ciders, and soft drinks. It’s an opportunity to sample the wonderful variety of drinks that are produced by Polgoon, with expert advice from our tour guides. We include food matches designed to compliment each drink, and demonstrate how important pairing food and drink can be when creating a meal. If you can’t get down to west Cornwall where can people taste your drinks? Polgoon products are available in independent food and drink retailers across Cornwall. Our soft drinks can be purchased at many popular cafes, bars and restaurants across the county, including The Old Quay House. Keep your eyes open for the lovely new-look branding! Our ciders are sold directly to retailers including Rick Stein’s Deli in Padstow and Cornish Food Box in Truro. Our wines are available through local wine merchants. If you are looking further afield try Bristol Fine Wine in Clifton, and English Wine and Spirit Company or Fortnum & Mason in London. Our full range is available from our farm shop and via our website. We also make our own Cornish food and drink hampers. Our most popular hamper includes our 2013 Sparkling Pinot Noir Rose with Nicky Grant’s handmade chocolates.